Jul 15, 2014 @ 10:00 AM — by Retina Associates, P.A. When our eyes are healthy and functioning as expected, it’s easy to take our vision for granted. However, the human eye is an incredibly complex and sensitive organ, and if one of its parts fails, vision can become permanently affected. In the case of retinal detachment, patients must seek timely and effective treatment if they wish to prevent long-term damage to their eyesight. By learning the causes and symptoms of retinal detachment, you can seek the appropriate treatment before it’s too late. Take a moment to peruse the following information on how this condition may form, as provided by our Kansas City eye care center. The retina is a layer of tissue that coats the inner eye. It is this part of the eye where light is projected and received by optic nerves, which transmit the information to the brain. Any damage to the retina can therefore impact a person’s vision, from minor vision loss to total blindness. 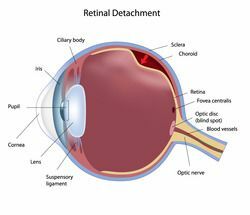 Retinal detachment is a condition where the retinal tissue peels away from the inner wall of the eye. As a result, areas of vision may be obscured or lost, as light cannot be properly transmitted through the eye to the optic nerves. Retinal tear: If a small tear or hole appears in the retina, fluid (vitreous gel) that is normally contained in the center of the eye may leak through the retinal tissue, pooling under it. This pressure from beneath the retina can cause it to peel away from the eye’s inner wall. Retinal tears usually occur in patients who are severely near-sighted, have had prior eye surgery, or have thinning retinas due to age. Although most retinal tears are caused by natural changes in the eye, sudden trauma to the head or eye specifically may also cause this. Fluid build-up: Even if the retina is not torn, other fluids may accumulate beneath it to result in detachment. This is most commonly the result of a disease such as central serous retinopathy, which gradually leaks fluid from connective tissues into the retina. Other diseases that cause the retina to become swollen or inflamed may have a similar effect. Diabetes: A history of high blood sugar may result in a retinal disease called diabetic retinopathy. This condition causes blood vessels to leak fluid within the eye, which may alter vision on their own or form scar tissue along the retina. This scar tissue exerts pressure on the retina, pulling it out of position. Persistent “floaters” - strings or dots that seem to float across your field of vision. Flashes of light near your peripheral vision, particularly when you move your head or eyes. Partial loss of vision, as if a dark curtain is blocking part of your eye. If you suspect a tear in your retina or a retina that has already been detached, seek professional help immediately. Contact our office to schedule an appointment or to ask a question about any of our services.